You are cordially invited to take part in a Soft Touch Workshop! Soft Touch is a gentle way of massaging your dog which brings about an empathetic transfer of energy, a strengthening of your mutual bond and an enhancing of your dog's well-being. Soft Touch massage is especially beneficial for older dogs and for dogs that have suffered from cruelty in the past. Regular Soft Touch massages, lasting just 5 minutes a day, will help your dog achieve inner balance, gain trust and will also support the body's healing process after an illness or operation. 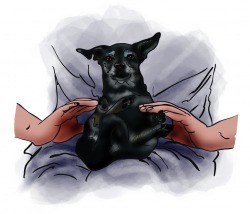 In addition, Soft Touch massage will teach you to know when your dog is not feeling well. 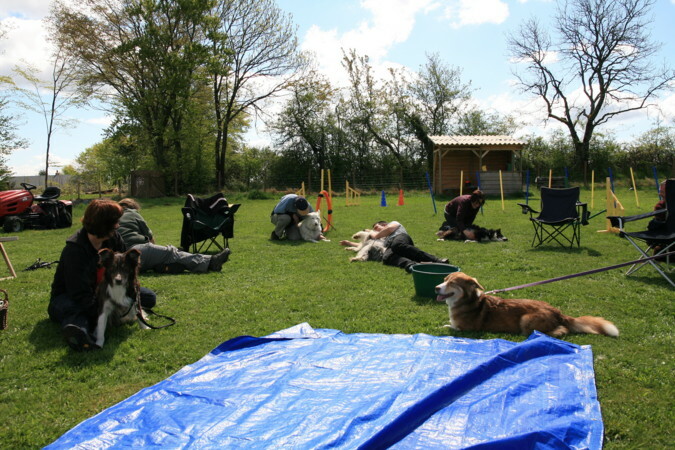 During the Soft Touch Workshop you will learn ten different ways of massaging your dog. A Soft Touch Workshop takes about 4 to 5 hours, depending upon the number of participants (maximum 15). Sisqo: a severely traumatized greyhound that was afraid of people and would not stop barking when a stranger entered the house. Sisqo now happily greets every visitor who stops by. 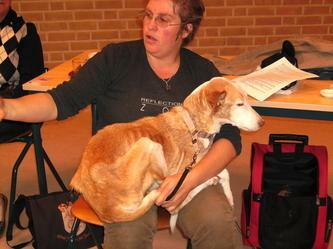 Gaija: a small podenco that was terrified of people approaching her outdoors and tried to run away in a panic. Gaija now calmly stays by her owner's side when meeting people in the street. 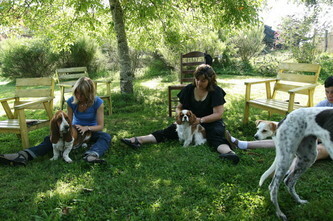 The fee for participating in the Soft Touch Workshop is 40 euros per person (including the dog). All participants will receive a collection of massage instructions and each dog will be given a surprise present! If a dog training school or an animal association takes over the organization of a Soft Touch Workshop, 10 euros for each participant will be donated to this school or association. The organizing school or association will be responsible for arranging the venue and for collecting the participation fees. 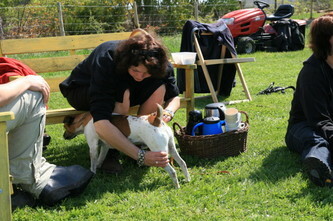 I developed Soft Touch after many years of working with traumatized dogs. My approach originated from in-depth personal experience in numerous dog massage techniques, from animal healing methods, and from helping many animals with emotional and behavioral problems. Soft Touch incorporates elements of traditional massage, TTouch, healing and grooming. Soft Touch Workshops have already been a success in France and the Netherlands. Soon the first Workshop will be given in Belgium and Portugal. Soft Touch Workshops can be held in French, English or Dutch. If there are enough participants for 3 workshops (x 10 people min) then I can come by plane to your country (Europe only).